Fantasy epic "The Lord of the Rings: The Return of the King" was named best film at the British Academy Film Awards on Sunday, while "Lost in Translation" co-stars Bill Murray and Scarlett Johansson took the top acting honors. 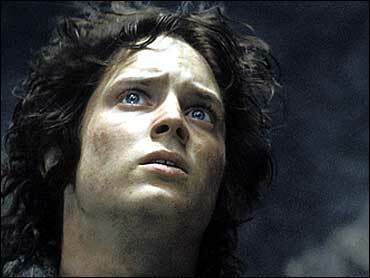 "The Return of the King" was nominated for 12 awards, known as BAFTAs, and won five: best picture, cinematography, adapted screenplay and special effects, as well as film of the year as voted by the public. In accepting the prize for best film, New Zealand-born director Peter Jackson honored the trilogy written by Briton J.R.R. Tolkien. "We were a bunch of Kiwis and some Australians" who brought to the screen "one of Britain's most beloved books — a fantastic property," Jackson said. The third installment in the film trilogy is nominated for 11 Academy Awards, which will be held Feb. 29. The British awards have become an important pre-Oscar stop since being moved to before the Academy Awards. "The Return of the King" beat Anthony Minghella's Civil War saga "Cold Mountain," Sofia Coppola's quirky "Lost In Translation," Tim Burton's whimsical "Big Fish" and Peter Weir's seafaring saga "Master and Commander: The Far Side of the World" to take the best-film prize from the British Academy of Film and Television Arts. Weir won best director, and his naval adventure won four awards in all. Renee Zellweger was named best supporting actress for "Cold Mountain." The civil war drama led the nominations with 13, but won only two awards — Zellweger's and best music. The best supporting actor went to Bill Nighy as amiably dissolute rock star Billy Mack in the British romantic comedy "Love, Actually." "Lost In Translation," only its young director's second feature, won three BAFTAs. In taking the best actress award, 19-year-old Johansson beat her own performance in "Girl With a Pearl Earring," as well as Uma Thurman for "Kill Bill," Naomi Watts for "21 Grams" and Anne Reid for "The Mother." Johansson thanked the British Academy "for acknowledging … a 19-year-old American actress" and then thanked her mother for "taking me to auditions and buying me hot dogs afterward." Sean Penn also was nominated twice in the best-actor category — for "21 Grams" and "Mystic River" — but lost out to Murray's jet-lagged movie star adrift in Tokyo in the comedy of cultural dislocation. "Girl With a Pearl Earring" was shut out the awards despite 10 nominations, as was Clint Eastwood's intense "Mystic River" — an early Oscar favorite — which had four nominations. Several small, independent features were rewarded with prizes. Sundance hit "The Station Agent" won the best screenplay award, while the prize for best British film went to "Touching the Void," Kevin Macdonald's powerful docudrama about an ill-fated mountaineering expedition. A British film also won the award for best film not in the English language. Michael Winterbottom's "In This World," shot with amateur actors across two continents, follows two Afghan refugees on a perilous journey to seek asylum in Britain. Emily Young, writer-director of "Kiss of Life," won a special achievement award for a first-time filmmaker. The ceremony at a movie theater in London's Leicester Square was sprinkled with Hollywood stars, including Zellweger, Thurman, Penn, Johansson and Johnny Depp, who arrived late and made a last-minute dash up the red carpet.